Identify and correlate pathology specimens with the Specialty CNI System (Consecutive Number Identification), a three-part labeling program that saves time and reduces errors. Three different labels are each imprinted with identical consecutive numbers, each designed to function in a different step of tissue examination. The first label features the number printed in permanent, black ink on sturdy card for use inside cassettes. These ¼" x 1½" labels come in booklet form with a perforation between each label. The label has no adhesive. It fits beside the tissue, inside the cassette, and remains unaltered throughout the use of solvents. 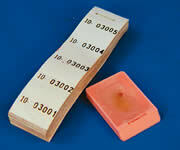 The second numberlabel has pressure sensitive adhesive ¼" x 1" to fit the paraffin block. This label can also be used on the specimen storage container, correlating the whole specimen with its sections. Permanent adhesive secures the label in place and makes any removal attempt or alteration immediately evident. A 15/16" square, permanent pressure sensitive adhesive label carries the number in step three. These labels hold firmly on the glass slide and ensure correct identification through examination and storage. Standard warning labels to identify cytotoxic samples and materials. Paper labels leave no residue behind after removal, and are for use at ambient temperatures. 77430-05 Incinerate 2 x 9"
77430-06 Incineration 1.312 x 9"
77430-07 GHS* 4 x 3.5"
77430-08 Radioactive* 2.72 x 1"
77430-09 Radioactive 2.72 x 1"
Before Use 1 x 2"
Quickly identify outdated laboratory items such as reagents and controls. These labels provide space for noting the date that the items were received, opened and when it will expire. A permanent adhesive holds the label firmly in place on a variety of surfaces. The label measures ¾" x 1½" and are supplied in rolls of 500 labels. Available in standard thickness only with square corner or round corner on 8½" x 11" sheet. Price is 5000 labels per carton. Designed to adapt to a wide range of laboratory procedures. These labels withstand dry ice, liquid gasses, deep freezes, acids, oils, greases, salt water, fresh water and soap. Their textured surface may be marked with pen, pencil, or felt marker. Pressure-sensitive adhesive sticks to almost any surface or shape. Specialty Stain Cloth Labels are supplied pre-cut on protective backing paper. Each label is perforated making it easy to remove the label from the roll. These labels are available in a variety of sizes. Labels ⅝" in width come in sheet form only; all other sizes come on rolls of 1000 labels. These specialty Microscope Slide Labels and matching End Labels are available in standard (thin) or pathology (tissue high) thickness, and square or round corner (RC). Permanent adhesive holds labels in place during use and long-term storage.